Alina Zagitova of Russia performs her Free Skate at the 2019 World Figure Skating Championships. Alina Zagitova of Russia pounced on the gold medal in the Ladies’ event at the 2019 World Figure Skating Championships on Friday night in Saitama, Japan with nearly 13 points to spare. Elizabet Tursynbaeva of Kazakhstan took the silver, becoming the first lady from Kazakhstan to win a world medal, while Russia’s Evgenia Medvedeva pocketed a redeeming bronze after what had been a rough season. Coming off a rough free skate at 2019 Europeans where she won silver, Zagitova rebounded in Saitama, attacking and landing seven triple jumps—including two triple Lutzes—in her “Carmen” routine. The 2018 Olympic Champion earned a level 4 on all spins and footwork to score 155.42 for first place finish in the free skate and overall (237.50). The 16-year-old had nearly 13 points to spare when all was said and done. Tursynbaeva became the first lady to land a quad Salchow in a senior international competition, which she opened with in her free skate to “Otono Porteno.” The 2019 Four Continents silver medalist stepped out of a double Axel, but that was the only error in another otherwise solid performance that featured six triple jumps and level 4 spins and footwork. She scored a new season’s best of 148.80, placing fourth in the free skate and second overall (224.76). Medvedeva gave a redeeming free skate after an unsatisfactory season which ended in a “there-you-go!” fist pump. The Olympic silver medalist only had one error in which she underroated a double Axel. Elsewise, she landed all seven triple jumps cleanly in her tango routine to music by Astor Piazzolla, including a a triple Lutz and triple flip-double toe-double toe. All spins and footwork were graded a level 4 and she earned a season’s best of 149.57 to finish third in the free skate and overall (223.80). The two-time world champion said that “weakness” was the main source of energy. Japan’s Rika Kihira, who stood in seventh after the short, nailed her opening triple Axel-triple toe, but fell on the next triple Axel solo attempt. 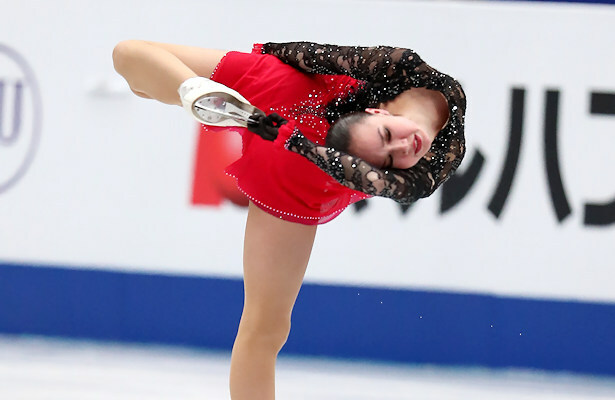 The 2019 Four Continents champion went on to land five more triples in her gutsy routine to “Beautiful Storm.” The 16-year-old earned a level 4 on all elements and finished second (152.59) in the free skate and moved up to fourth overall (223.49) in her debut at this event. Japan’s Kaori Sakamoto, who stood in second after the short, finished fifth in the free skate with a new season’s best of 145.97. The 2018 Skate America silver medalist popped a triple flip in the last half of her routine to The Piano, but was otherwise solid, landing a total of six triple jumps. All spins and footwork were graded a level 4, however, her total score of 222.83 was not enough to maintain second and she slipped to fifth overall. Moving forward, the 18-year-old from Kobe plans to practice harder and build more confidence so she can come back. Teammate Satoko Miyahara, who stood in eighth after the short, finished sixth in the free skate (145.35) and 215.95 overall. The defending bronze medalist stepped out of the final jump on a triple flip-double toe-double loop, but that was the only major error in her fearless routine to “Invierno Porteno,” which also featured a total of seven triple jumps. USA’s Bradie Tennell immersed in herself in her “Romeo and Juliet” routine, landing seven triple jumps after a disappointing free skate at 2019 Four Continents that left her in fifth place. The 2018 Internationaux de France bronze medalist earned a season’s best of 143.97 for a seventh-place finish in the free skate and moved up from 10th to seventh overall (213.47). Russia’s Sofia Samodurova gave an entertaining and sassy routine to music from Burlesque, all seven triple jumps were cleanly executed with one arm raised overhead. The only error came when she received an singled the final jump of a planned double Axel-double toe-double loop. The 2019 European Champion scored 138.16 to finish eighth in the free skate and eighth overall (208.58) in her debut at this event. USA’s Mariah Bell placed ninth overall (208.07), followed by Eunsoo Lim of South Korea (205.57) to round out the top 10 ladies. Somewhat of a pall was cast in the event when reports emerged that Lim’s management company reported she had been intentionally cut by Bell’s blade during practice before the Ladies’ Short program. Social media and other news outlets were ablaze with speculations. The incident was verbally reported by the Korean Team Leader to the the International Skating Union (ISU), but no official report had been received at the time. The ISU released a statement on Thursday in which it found no foul play and encouraged the respective figure skating associations to work it out. At press time, no other official word had come from either skater, the ISU, Korean Skating Union, or the United States Figure Skating Association.